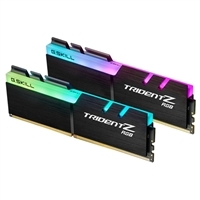 G.SKILL Trident Z RGB series is one of the worlds most revolutionary RGB lighting DDR4 memory kits. Featuring a complete row of LEDs brilliantly displayed through an uncovered full-length light bar, Trident Z RGB series is capable of displaying a wide range of vivid colors. Along with the strong foundation of G.SKILL overclocking memory development technology, highly screened components, and custom 10-layer PCB, the Trident Z RGB series is the ideal DDR4 solution for building an extremely stylish performance PCs.